Here we have our White Cue Ball with Red spots. 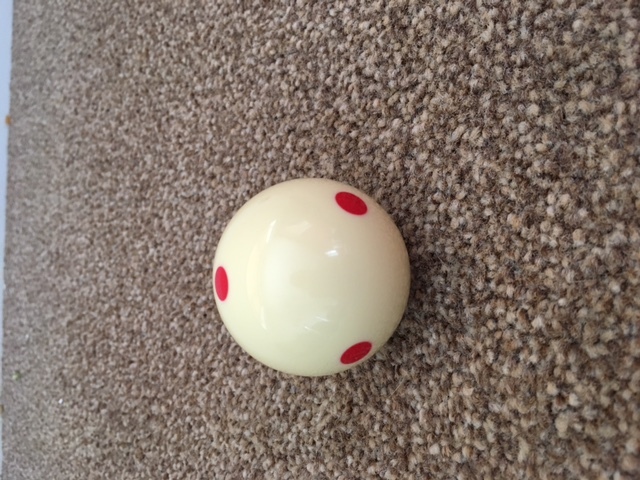 This is a practise/trainer White balls. It is an 1 inch and 7/8 in size, standard UK size. Not Aramith but is the same weight and size. We offer Free Delivery to most of the UK mainland. For the areas of Scotland, Cornwall and Highlands please contact our sales and support team to get a delivery quote. It is advisable for you to contact us regarding your postcode to confirm if qualify for free delivery. We not only Deliver your Pool Table but offer a Full Installation service. Delivery and Installation is a 2 man delivery, were 2 of our highly skilled fitters come to your chosen destination and set the Table up where ever you request. The Table is then fully installed and levelled so that the Pool Table is left ready to play before we leave. This is based to a ground floor level only. Any other floors, 2nd, basement etc. please advise us. Prices start from £99.00 ground floor level only. Other floors may be more, so please contact us on 01248 852442.